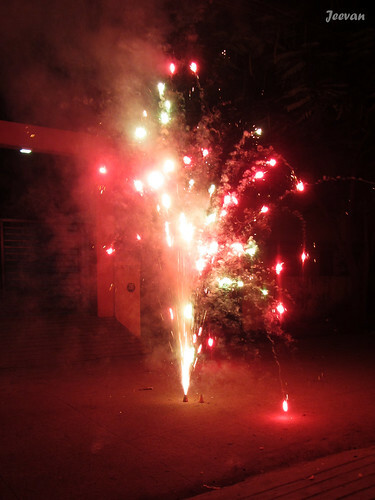 Deepavali passed off pretty well last week and I had wonderful time celebrating and going out watch the dazzling fireworks displays from the neighbourhood. I wasn’t doing much anything these days but too lazy or not interested to post or write something while I was in festival mood and relaxed being. Though the day wasn’t great or differs from a regular Sunday, that begin with watching television and having curry kulambu for breakfast, the evening turned wonderful with lighting fireworks and going to beach to watch the aerial fireworks light up from the neighbourhood. I took many photos/videos on the fireworks display either at ground or sky; it was fun shooting from three different cameras – iPhonse SE, Canon powershot and Gopro hero 5. More photos to come soon and do check the video at end of the post. Unlike earlier people don’t look or feel festival and even greeting each other has come down, but I shouldn’t wonder really about it as confronting smile had dropped from day-to-day life. But I was more cheerful cherishing my old memories and I couldn’t prevent happiness popping up and the sound of crackers makes feel festive. 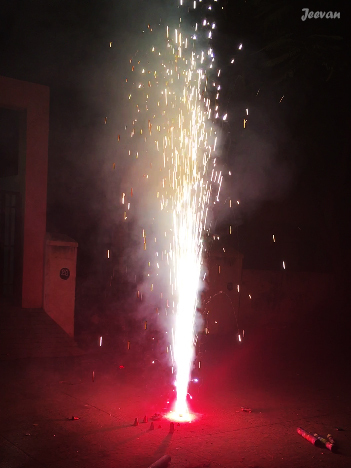 Compare to previous years, bursting of fireworks are less this year but there was high smoke on Deepavali evening/night. The high humidity in air and along with mild fog the firework smoke sustained into the ambience without gaps to escape. But it turned normal next day. I really amazed at the level of noise reduced this year and the interest on firework drop. The people say price raise, GST and demonetisation, but this isn’t matter really and from my observation, the firework price was bit less comparing last year. Moreover the sudden environmentalists has created a irk feeling and people doesn’t want to be pointed out guilty or whatever they say, its better leave alone those unwanted to burst. I’m sure in future bursting fireworks will be reduced and children who aren’t interested in firework shouldn’t be forced and it will help in transformation. The environmentalists should continue to voice against pollution instead popping head on Diwali alone. Fireworks do not rule us all the days and it highlights what really hides within and unlike crackers it destroys quiet. I enjoyed your fireworks photos and video. 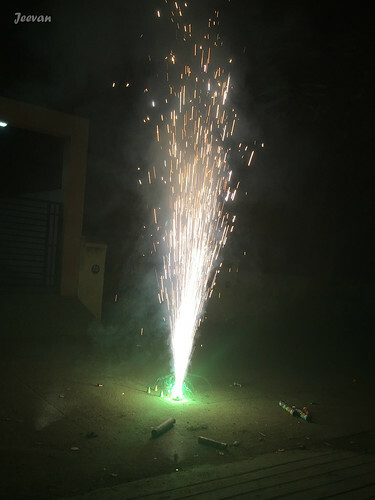 Fireworks are still very popular here, although they are regulated and some people complain about the harm they do to the environment. Our community puts on a fireworks show each Fourth of July, and plans on continuing to do so. Forcing others to burst, be it kids or adults, seems to be a favorite past time in India during Deepavali. Oh those powerful environmentalists..... In our country, they are VERY powerful. All of us have lighter and relaxed moods during festivities. Diwali has come and gone giving way to routine activities. Enjoyed your pics and video! Wonderful fireworks photos and great video ~ ^_^ ~ Amazing to see ground fireworks ~ not legal in USA. Hello, I enjoyed the fireworks display. Great video and photos. I am sure you have a great Deepavali celebration and with lots of food to enjoy!